When I load up GameShow, it recognizes the Roxio Game Capture device; however, it doesn't work within the program itself. Is the Roxio compatible with the GS? Please respond. Thanks. Not sure, not something we have ever tried or been asked about. When you say Gameshow recognizes it, but that it does not work, can you provide more details? What resolution and device were you attempting to capture? Did Gameshow auto detect the resolution in the (...) tab for the device or do you have a drop down? If it had a drop down, did you try other resolution options in addition to the resolution you were sending it? It will help us help you much faster! Please note, the forums are great for finding quick help on setup or tips or talking about issues you are experiencing, but in order for us to actually provide support, we need you to go to the help menu and hit "Send Support Information" within Gameshow. When I say it recognizes the Roxio device, it gives me the option to select it. The problem is that once the program goes to the main screen, all I get is a gray screen with the GS logo. I've tried the other resolutions and had no success. It shows the Roxio device on the bottom left-hand side, but no picture. Also, I have the Roxio software up-to-date. I'll attach some screenshots to this message if that helps. Thanks. BTW, there was a drop down menu and I selected System Device. Another pic for you to help explain what's going on. As you can see, I can select the Roxio, but get no picture. Thanks. You did not answer my questions... and they are important in order for me to help you. Also from the screen shots, you did not show me the tab I asked about, where all the important settings are for that source. 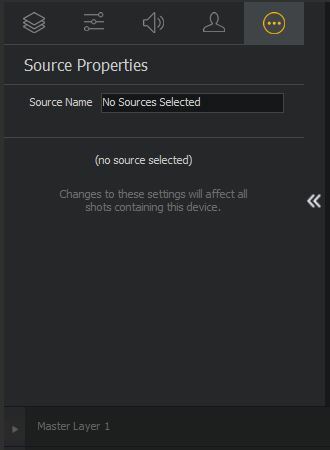 Capture cards do not generally auto-sense the resolution of the device you are attempting to capture. A few upscale, but you generally need to select the resolution yourself, which is in that last tab. You will not get video until you do in most circumstances. With the Capture card selected, please select the last tab (...) and post a picture of what resolution options you have. The video you need to watch is this one: https://vimeo.com/161403210 . Important part starts at about 1:08 in to the video. Please let me know what options you have there, what device you are trying to capture, and what resolution you have that device set to. My apologies for the misunderstanding. I watched the tutorial video and noticed that the person giving the tutorial had 'Capture Cards' as a selectable option. I do not have this option. Is the gentleman using an older version of GameShow? The only option I can select is 'System Device' and then a window comes up where I can select Roxio as an option. Also, the picture attached is the(...) tab as you requested. As you can see in the screenshot, there are a few resolutions in the drop down menu. None of these resolutions work when I select each one. I am using the Roxio Game Capture Pro HD and I'm trying to capture footage from the Xbox 360 and the resolution for it is set at 1080p. Thank you for your time. Thanks for the last screenshot. The UI in the video does look a bit different than your Screenshot. I would suggest changing the "Capture Device size" to 1080p (1920x1080) so it matches xbox output. See if it works for you then. The other important thing is to actually have the source selected. (if you noticed, the top of the Source Properties does not have the name of your source, and it actually says that nothing is selected).You are halfway there, you have the shot selected, but you also have to select the source. So click on the preview canvas so you see the selection box around the video from the capture card. You should then see the Source name appear on the right side below the Source (System Device) Properties tab title. I cannot change the 'Capture Device Size' because it only gives 640 x 480 as my only option. As you can see in the screenshot, I'm still having the same results even after selecting the right source. Then click on What's new? You could probably use the Roxio software, and then capture the window using Gameshow. Yeah, the software has been updated so I knew that wasn't an issue. Thank you guys for your help. I'll either capture the window using GS or just purchase an El Gato or something up-to-date. I would ask around on our forum to see what other people are using and have no issues. I also know that Bryce Stejskal can give you some ideas on best capture card to use as he does the Gameshow Show on Twitch. Sorry to hear about the troubles you are having with that device. It is odd that it is not working, as standard directshow devices should just work. I say should, because certain capture cards have some weird things done with their drivers. PCIe cards are way better than USB, so if you have the option, go for PCIe. Do not buy the AVerMedia LGP, it is 32bit only and essentially abandoned as well. The AVermedia LGX/Razer Ripsaw are the same card and work ok, but not my favorite. Gamer oriented cards tend to be finicky. Going with broadcast oriented cards is usually a better choice, although can be more expensive. Magewell has been essentially flawless during my testing in every regard, though a bit pricey. BlackMagic makes some good stuff, though the Intensity Pro 4K is currently unsupported due to a colorspace conversion issue. We are working on it. Avoid the BlackMagic Intensity Shuttle. They have audio issues across all software. The Elgato HD60pro PCIe card is ok. When the 64bit drivers first came out there were a lot of issues but I think most have them been fixed as of now. Unfortunately, I have yet to find a cheap "Holy Grail" card, but I have one from YUAN I am going to test today. If it works well it will be "THE" card to get, and they make a USB version of it as well. I will go ahead and put in a request for the Roxio for support. We will most likely have to make a custom graph for it. Jermaine Smith hi, i actully just purchased gameshow on the black friday sale and still use my roxio hd pro as well and my avermedia live gamer portable. did you happen to have any luck with getting thr roxio work? Cody Welch No sir. The last time i tried was about two months ago and still had the same results. Jermaine Smith i find this fairly disappointing, im sitting here trying to get my capture to work and nothing, i kinda feel like this is shovel ware, unless i purchase a expensive captire all over again. i was running xsplit, figured i would give this a try. should known it was going to be useless. i couldnt get my old diamond capture to read that i use for retro consoles. im wondering if the avermedia will even work. Cody Welch Yeah, thats what i did...just went back to XSplit. Jermaine Smith im just glad I didn't losses to much on it. but pretty lame imo that the goal is to push off more expensive capture cards with no official supported products page when buying. lesson learned telestream. Cody Welch Well, maybe GS will fix the issue in the future. Also have to keep in mind that Roxio hasn't had an update for the device in two years and that may be an issue. They no longer support it. Cody Welch I agree with what you said. Maybe a GS rep could elaborate more on that issue. Sorry to hear about the issues with the ROXIO device. One issue with older devices in the difference between 32bit and 64bit. Many older capture cards only have 32bit drivers available, or worse, do not even expose the directshow filters without intermediary software running(AVerMedia LGP). We are a 64bit software. While we could offer a 32bit version, there is a much higher likelihood of issue cropping up in 32bit versions due to memory limitations. For this reason, we opted to not offer a 32bit version. ROXIO - We have thus far only received two requests for this device, both of which are in this thread. We make an effort to test the most popular cards, and even more obscure ones, as long as they are 64bit. The fact that the ROXIO device even shows up makes me think that there are 64 bit drivers for the ROXIO, but that they did something odd with the DS Graph. With only two requests for the device, it does not seem as if it is incredibly popular, but I will contact them and see what we can do. Sounds good, it's strange to tgat I eas able to get a old external video called a diamond gc500 to work. the roxio is far superior and still works for all practical uses. I'm not the type to upgrade for a small difference that may not effect my usages. Bryce Stejskal Thanks for the reply and your efforts. Thanks for getting back to me and providing further description of your concern. I was unable to verify a registered product under your account or perhaps your software is registered under someone else's account. If so, please do provide me for reference. Upon reviewing the forum and screenshots herein, you are just using the capture device to your streaming software, correct? If so, I regret to inform you that at the moment, it is not recommended to use the capture device to other platforms. If this is the case, the only thing I can do is get this issue forwarded to the appropriate department and see what they can come up with. Seems like they do not really want to support that device. I will follow up. I have this exact issue currently on a Roxio Game Capture HD pro. Really disappointing as the roxio software is absolute crap and I was going to buy gameshow but now there is no point. Can't stream at all now.